An adventurous, travel-hunting couple might want to get married abroad! Well, Greece, known for its beaches, music and food, is the ideal destination for a wedding party to remember. Still, since there is some paperwork involved, and it’s best to be prepared, we thought we give you a rundown of all the necessary steps. Here is what you need to know and do to tie the knot legally in Greece. First of, here is a Fun Fact regarding a wedding in Greece; you must publish a wedding notice (one for the bride to be and one for the groom to be) in a local newspaper in Greek 8 days prior to the marriage license issuance. Rumor has it that all the locals must be informed about an upcoming wedding in their region so as to avoid cases of bigamy! 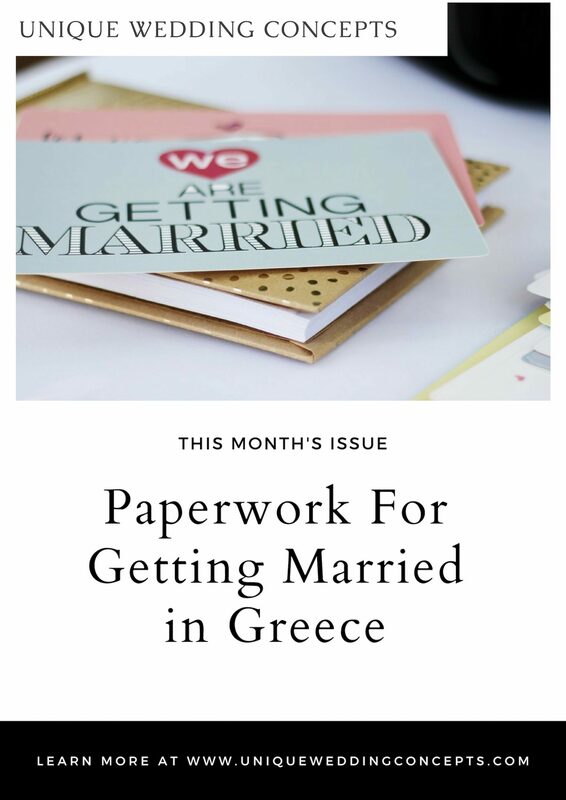 To apply for a wedding license in Greece, the bride and the groom must each submit the documents below, although the list may vary from place to place all over Greece. But, the only thing you will have to do is to gather the documents, put an Apostille Stamp and send them to us. We will take care of the rest; we will translate them into Greek, apply them to the local Town hall, issue the marriage license and arrange all the legalities! Then, after the wedding, we will translate the marriage certificate in the language of your preference, put an Apostille Stamp and mail it to you. Then, you just have to apply it to your local register’s office, and you are officially married to your country too! Traditionally, most civil weddings in Greece take place inside a City hall; however, this is not always the case, and our wedding experts can recommend on locations where we can plan the ceremony at the wedding venue of your preference! Best thing to start from is to hire Unique Wedding Concepts as your destination wedding planners! We will handle all the red-tape on your behalf and you could already jump to finding your dress! See? It’s not that much! Contact our destination wedding planning agency and we will help you organize your legal wedding in Greece!